Billie Jean King’s 1973 match against Bobby Riggs was anything but normal. It was 40 years ago today, September 20, 1973 when Billie Jean King struck a major blow for women’s athletics by defeating the flamboyant Bobby Riggs in a made-for-television extravaganza billed as the Battle of the Sexes. It is hard to step back in time 40 years and remember just how different the perception of female athletes was at that time. While today great female athletes are revered for their talents and in some sports are regulars on network television and in front of large stadium crowds, in the early 1970s women’s athletics was given very little value by much of the general population. While today women are generally judged athletically based on their own skills and abilities, in the early 1970s equal rights era many dismissed the accomplishments of even the best female athletes because they were obviously not competitive with male athletes. In early 1973 former men’s tennis champion Bobby Riggs proved that by thoroughly dismantling Margaret Court, one of the top women’s tennis players of all-time and still today the record holder with 24 Grand Slam singles titles, 6-2, 6-1. 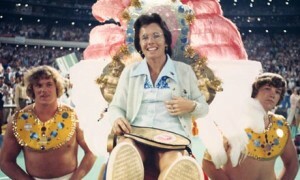 Before facing Court, Riggs had actually first challenged Billie Jean King, but King initially declined the match, which led to the contest against Court. After Riggs defeated Court, he again challenged King and this time she accepted. Their match was played in front of a crowd of more than 30,000 at the Houston Astrodome and viewed by an estimated television audience of 50 million in the U.S. and 90 million worldwide. Howard Cosell, who was at the peak of his visibility on ABC Sports and Monday Night Football, was the lead broadcaster for the match. 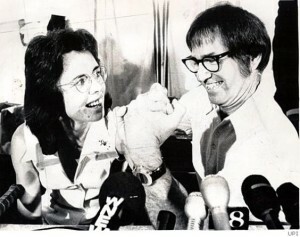 Do You Think Bobby Riggs Intentionally Lost His Match Against Billie Jean King? King and Riggs did a great deal of publicity prior to the match, which was watched by 90 million people worldwide. From the very beginning it was clear that this was not any ordinary tennis match. King entered the stadium carried aloft in a chair held by four bare-chested muscle men dressed in the style of ancient slaves. Riggs followed in a rickshaw drawn by several scantily-clad models. He then presented King with a giant lollipop and she gave him a piglet named Larimore Hustle. The match itself proved to be somewhat anticlimactic. Rather than aggressively attack the net, King stayed primarily at the baseline letting Riggs make mistakes. He was clearly not in his best shape and made many errors throughout the match. King claimed the first set 6-4 and then cruised to victory by winning each of the final two sets by identical 6-3 scores. Many credit the victory by King as being a spring board towards women’s sports being taken more seriously. Coming just a year after the Title IX legislation that mandated equal access to athletic competition, King’s victory was even more significant because it gave female athletes a new found level of respect at a time when they were also gaining more opportunities to compete. Because Riggs was always known as a hustler and big gambler, over the years there have been some questions as to whether Riggs played at his full level of ability. One report was that Riggs tanked the match to secure more money for a rematch. Indeed, Riggs did push for a rematch, claiming it was in the original contract, but King refused. Riggs was a master of self promotion. Most, including Riggs and many of his close associates, have dismissed that notion, but in August of this year, ESPN ran an Outside the Lines report that included supposed witnesses who were aware of a fix. With Riggs having passed away in 1995, we will likely never know the complete truth. However, what is indisputable is the important role that King, Riggs and their spectacle was a major catalyst towards the success of the Women’s Tennis Association (WTA) and the ascension of women’s sports in the national interest.